I love ribbon. Satin, paper, wired, grosgrain. It doesn't matter the kind. In my pastry kitchen I have spools and spools on a dowel to tie around cake boxes. Each ribbon is "frenched" to add the little notch at the end. Love it. Add tissue paper and a nice sticker and I'm all yours. When I read the title to the recipe, I honestly thought that we were going to make a pasta dish. Oh contraire! The tagliatelle are ribbons of zucchini. It was going to be just plain fun to make. Fun and really pretty. Plus, it's fresh, healthy and so lovely! Poor zucchini. It gets mispelled, and is one of the vegetables we're happy to see... for awhile. Then they end up in the office breakroom in a pile looking for good homes. Sometimes they even end up on your doorstep! 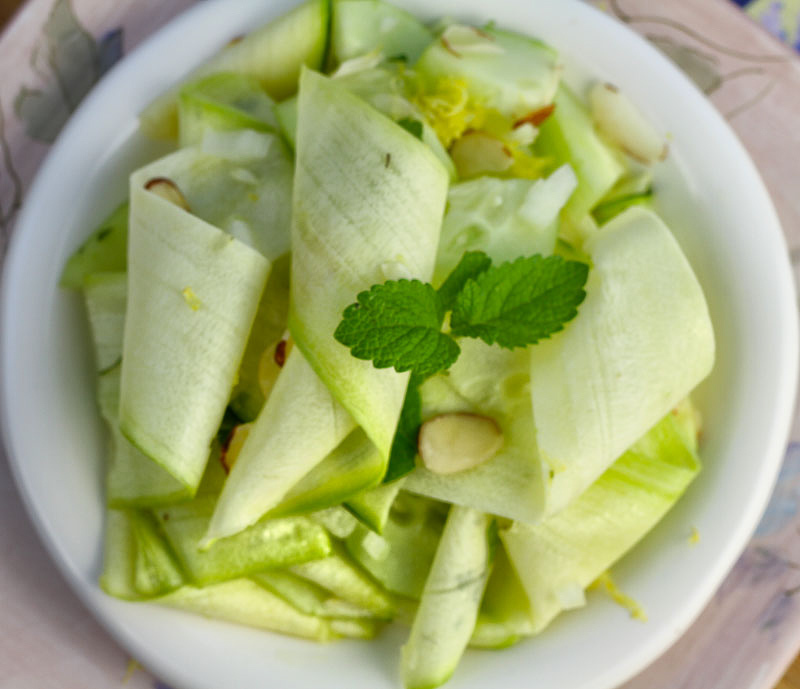 With the help of a mandolin, the zucchini in this recipe is sliced into gorgeous ribbons. 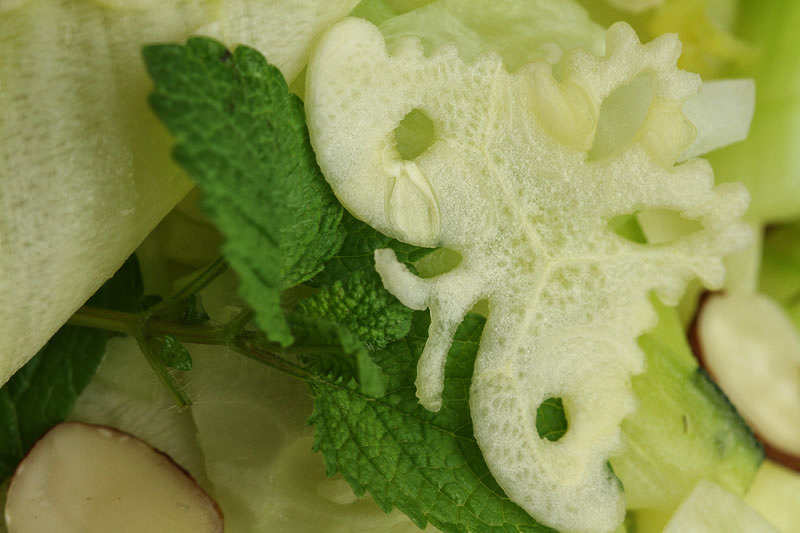 With the addition of simple lemon viniagrette, cucumbers, mint and lemon the ribbons become a beautiful salad. This week's French Fridays with Dorie recipe makes the zucchini the star. No mock apple pie, bread, pizza, just simple pretty zucchini. I feel badly that I can't post the Around My French Table recipes on Fridays. If you've been following my blogs each Friday, you might want to take the plunge and buy the book - or check it out from the library, if you don't already have it. It's going to be a classic and I promise you won't be disappointed. Good news. I'll be making it up to you next Tuesday. It's a surprise! When we were in San Francisco, in Chinatown, a shop keeper gave Gary a demo of some super sharp and cool garnishing tools. He bought three and has been eager to give them a try. Once I finished with my recipe he asked if he could use the left over pieces. A few minutes later he brought me the pretty carvings to garnish my plates. So pretty! The best tool for making the ribbons is a mandolin. It's a razor sharp blade to pass the vegetables over. I have great respect for mandolins. Injuries from them are deep, fast and almost always require a visit to the ER. They may perfect for the ribbon making, but only with the guard and slow careful movements. 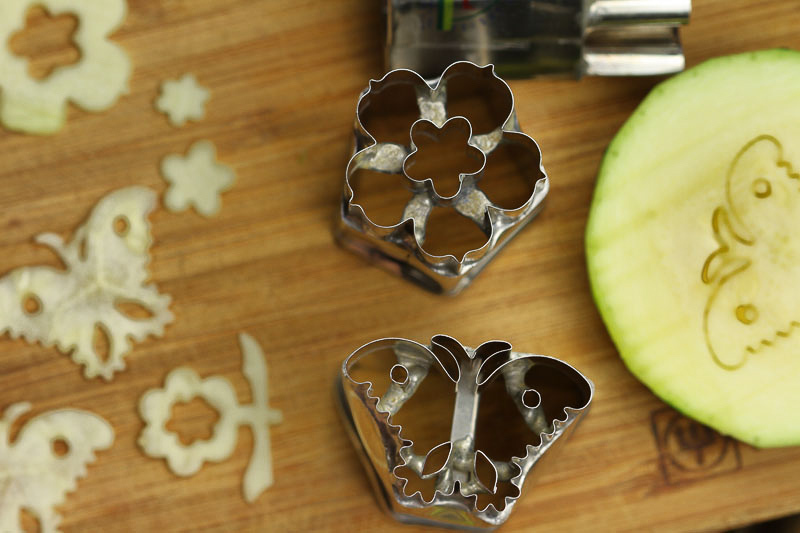 I'll tangle with the box grater, but never the mandolin. I got it out, was extra careful, and look at how great the zucchini turned out! Embrace the gifts of zucchini, and enjoy the bounty of the summer harvest! Stay tuned for a great dessert next week!